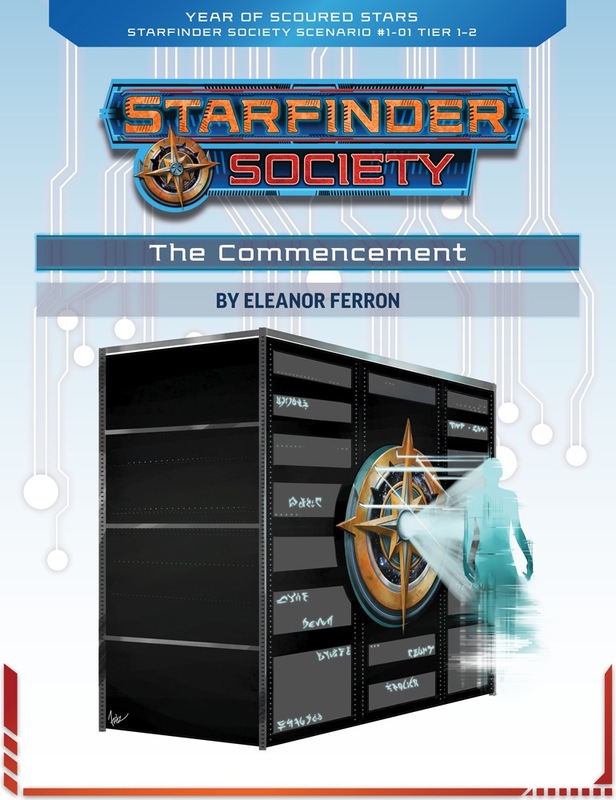 This scenario does an excellent job of introducing the Starfinder Society in-story and in terms of what type of mechanical challenges to expect. And, importantly, it accomplishes this will still providing a flavorful and delightful experience that I'm happy to replay. This scenario was my wife's first exposure to tabletop RPGs, and they are still playing regularly now, so I consider it a smashing success. This scenario is intended as an introduction to the Starfinder Society and its major factions. As brand new Starfinders, you’ll need to complete a task for each of the faction leaders. These tasks are fun, but quite minor. Although I really enjoyed getting to meet all the faction leaders, and the missions were enjoyable, I found the scenario as a whole an underwhelming introduction to Starfinder. You don't really do anything amazing (which makes sense), but when it's your first time playing a game you really want your players to feel like they did something cool. As a GM I love how this details in this scenario can change each time you play it, but as a player it still feels repetitive on a reply. I do enjoy this scenario, but not as a players first experience with the game. We had a blast playing this scenario. The race turned out to be way more intense and fun than I had initially expected. Heads up to the GMs, prepare that well I’m advance. Pair up the racers and ships and some up with the appropriate stats before hand. It’ll make keeping track of things easier. This is a solid game with a bunch of great elements and a great introduction to society play. You learn about each of the primary 4 factions, and get a great breadth of the kinds of gameplay (and tropes) available in Starfinder in general. I highly recommend you play it with at least one society character, and it's a solid replay for all of them. Yay, I can't wait! So, is Guidance going to be the Starfinder Society version of Futurama's talking heads? How many leading Starfinder Factions are there initially? Are the areas of importance of Absalom Station in here also in the AP #1 article? Anyone in eastern Quebec intending to play Starfinder Society? Is there another thread for this already? I'd love to play Starfinder Society in KÖLN, DEUTSCHLAND. We both live in the same city and want to play Starfinder - maybe we should meet and look if this works out? I´d be willing to GM too. When you say eastern Quebec, do you mean Eastern townships or farther east than the Eastern township, like the Chaudière-Appalaches, Bas-Saint-Laurent, Gaspésie? I'm from Montreal and plan to Gm in Montreal. I pulled the flip-mat I own and am so happy it's the own for that scenario. I have never before played nor GMed a Society Roleplaying Guild Scenario, but man would i like to. Is this the correct map? It sure is. You'll want the straight river side. Not to worry. This adventure will be available for purchase and download on August 17th. I just realized that Guidance is almost exactly like the bitek personas in Edenist habitats from Peter F. Hamilton's Confederation books. When Edenists die, they upload their personalities into the neural strata of a living habitat, joining their personalities with the others in the habitat and making their knowledge and experience available to current and future generations. Very cool! If I was to get the Core Rulebook pawns, would that aid me much in running this scenario? I approve of this if only because one day a Starfinder map is going to make it's way into a PFS scenario and it's going to be the cantina map and my barbarian is gonna wreck that cantina. Oh you have fancy space lasers and you have the death sentence on twelve systems? A space laser is a machine and a machine is just fancy city people talk for magic and my Kellid barbarian hates magic. Battle ax in yo' face, sucka! And you might ask "What if he's wearing fancy space armor?" All that means is I'll have to hit the guy more than once. I looked at the resource section and I couldn't find out what races are SFS legal. Granted I don't have the core book yet. They are not (yet), the legal races are detailed in the SFS Guide. 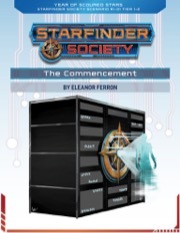 If you mean the Starfinder Society Roleplaying Guild Guide, I went ahead and linked it for you. It was linked in yesterday's blog. In general, it's a little tough to find the Starfinder Society stuff, right now. Those were awesome and have convinced me that I need the scenario. I want to say "OMG ZIGGY IS FRICKING ADORABLE BEST NPC EVER"
I've downloaded the excellent portraits Eleanor made, and fitted them 4 and 3 to a page, to save up on same ink costs for printing them. @Damanta thank you for putting that together. Planning to run this Sunday and that will be a big help. Do I need the society adventure path books as a player for society play?Or are these geared for GM use? If you are talking about the Starfinder Adventure Path, the first issue of which is entitled "Incident at Absalom Station." You don't need to purchase that as a player, but it has some good information about life on Absalom Station. If you're talking about these scenarios, you should not purchase them unless you plan to run them as a GM or you have already played them and just want to read them, yourself. They are absolutely not necessary for a player to own. Strawberry Machine Cake, that's all that needs to be said. Those are fantastic! I really want to see some of those characters appear again in a future scenario. "HEY THERE PRESSURE HEADS, THIS IS PRESSURE TV COMING TO YOU LIVE FROM THE BEEEE-RUTAL AFTERMATH OF TODAY'S JUNK RACE. AS YOU CAN SEE, MOST OF THE OTHER RACERS HAVE EXPLODED! IT WAS AWESOME! STANDING VICTORIOUS OVER THEIR CHARRED REMAINS IS THE STARFINDER TEAM, SPONSORED BY YOURS TRULY, MR PRESSURE. LOOK HOW ATTRACTIVE THEY ARE! TUNE IN NEXT TIME FOR MORE BADASS STARFINDER ACTION, HERE ON PRESSURE TV!" Guitar riffs play before cutting to a commercial break. the newest single off of Strawberry Machine Cake's album Star Sugar Heartlove!!!. I've done a lot of googling over this. The definition of "sugar pop" in the real world seems to fall on groups made up of young singers selected to perform together. Most of those don't fit the theme, very well. It seems Asian groups are getting a lot of attention to fill this role. Made a prop for SFS-101. Star Sugar Heartlove!!!. A lot of folks are going with something from BabyMetal, but that doesn't fit the loose description of "sugar pop" I have in my head. I've decided to go with 4Minute, because there are several of their songs on youtube that have a more happy sound. I put together my own playlist of songs that I felt were most appropriate. You're welcome to use it if you like. Paris's Strawberry Machine Cake playlist. This is AMAZING! Thank you bunches. I really, really, really love the CD case! FWIW, I went with a Swedish band called The Sound of Arrows, which is a little less anime-ish, but a little more in line with my group's musical tastes while still hitting that saccharine note. Glad to help. I'll have to check out that band. Yana! is the title of the third single released by Strawberry Machine Cake from their album Triaxian Summer Camp Friends. The titular Yana is a fabulously chic girl who has it all. The group’s millions of mega-fans quickly adopted the name as an expression of everything good and fashionable. Teens everywhere are still saying, "That's Yana!" when they encounter something they like. This. Is. Happening. At. Tonight's. Session. I got a mail about this having been updated, but it doesn't appear to have been updated yet? They did put out a new version, but they don't seem to have made the single change mentioned in the e-mail. Same here, I got an e-mail on 4/4/18 stating there was a change made for Subtier 1-2 the credits earned should be 753 but the change is not actually there... ? I've noted the same thing. I forwarded the email to customer service and asked them to verify the updated asset has been released. I'll reply here once I hear back. I'm still getting the same incorrect version when I download. Yep, that's actually true. Sheesh.